U.S. Defense Secretary Robert M. Gates thanks U.S. Army Spc. 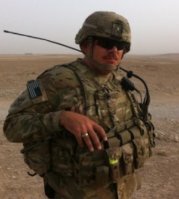 Gregory Miller for his service and sacrifice at Bagram Air Field, March 7, 2011. Gratitude has the power to uplift the heart and raise the spirit. I’ve written before about the power of gratitude, but it is always good to take the time to reflect about what we’re grateful for. 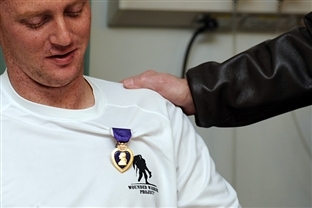 For many veterans, gratitude is focused on their coming home from some of the most significant challenges a human can face; their families, even more so. This is not universal, of course; many veterans feel guilt instead of gratitude, and this can hold them back. Is it possible to be both thankful for our own life, and have remorse for loss? Sure, but some veterans think the two are mutually exclusive. Whenever I think of gratitude, I think of the traditional Hebrew song, Dayenu, which is sung to celebrate the Passover Seder. To be perfectly clear, I’m not Jewish, but I don’t have to be in order to appreciate the wisdom, humility, and gratitude in this concept. The term “Dayenu” means “it would have been enough.” The term is sung as a chorus after a recitation of a series of historical events, starting with the Israelites being rescued from slavery. The concept goes like this: “If only we would have been rescued from slavery, but not carried out judgements against our oppressors, it would have been enough. If He had given us their wealth, and had not split the sea for us, it would have been enough.” Basically, the concept of Dayenu means that even the least amount of thing that we are blessed with is enough, and anything beyond that is even a greater blessing. So how does that apply to our lives? By considering the concept of Dayenu, we can literally count our blessings, reflect on those things that have happened to us, and appreciate them individually. For example: if I had met my wife, but not had children, it would have been enough. If I had children, but never get grandchildren, it would have been enough. Or: if I were given the responsibility of leading my fellow service members in the military, but not lead them in combat, it would have been enough. This is an exercise for focusing on the thankfulness of the least thing and seeing everything beyond that as an even greater object of appreciation. We can focus on small benefits, and build that gratitude on top of gratitude. It is considering our blessings individually, starting at the first, and appreciating them all at the level that accumulates into greater appreciation. This is not simply saying “Well, at least I…” as in “At least I have all my fingers and toes. What do I have to complain about?” It goes deeper than that: if the only thing that I had was my fingers and toes, then that would be enough; but then you go beyond that. Yes, I have my fingers and toes…and my health. If the change stopped there, that would be a great blessing. But then we keep moving up the chain even more: if I came back from combat, it would have been enough. If I came back from combat and returned to a stable family life, that would have been enough. If I came back from combat, returned to a stable family life, and got a meaningful job after leaving the military, that would have been enough. This exercise is about starting with the least best thing, and heaping more gratitude on it from there. In this way, gratitude builds on gratitude. The accumulation is not additive, it’s exponential; spending the time every day to reflect on our blessings increases our ability to think, see, and feel positively. It’s important to understand that our outlook drives our mindset and our behaviors; how we see is what we feel. What are you grateful for, least to most? I’d love to hear it, and share in gratitude with you. Post in the comments below, or share a comment on social media. If only one person would have read the words that I have written, and not been touched, it would have been enough. If one person was moved to action by something I’ve written, but not many people, it would have been enough. My gratitude, however, extends to each of you reading this, whether it is one or many…there’s somebody in the world that gives a crap. And where there is one, there’s more. The one is enough…everything else, as they say, is gravy.